Home » Controversial Topics » Politics » Where does President Trump stand on Turkey? Where does President Trump stand on Turkey? 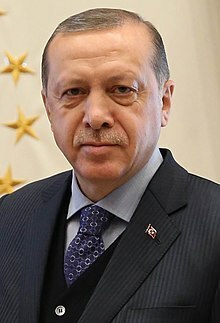 Recep Tayyip Erdoğan (born 26 February 1954) is a Turkish politician serving as President of Turkey since 2014. He previously served as Prime Minister from 2003 to 2014 and as Mayor of Istanbul from 1994 to 1998. Dwight D. Eisenhower	December 6–7, 1959	Ankara Informal Visit. Met with President Celâl Bayar. George H. W. Bush. July 20–22, 1991 Ankara, Istanbul	Met with President Turgut Ozal. Bill Clinton. November 15–19, 1999 Ankara, İzmit, Ephesus, Istanbul	State Visit. Attended Organization for Security and Cooperation in Europe Summit meeting. George W. Bush. June 26–29, 2004 Ankara, Istanbul	Met with President Ahmet Necdet Sezer and Prime Minister Recep Tayyip Erdoğan. Attended the NATO Summit meeting. Barack Obama. April 5–7, 2009 Ankara, Istanbul	Met with President Abdullah Gül and Prime Minister Recep Tayyip Erdoğan. Delivered a speech to the Turkish Parliament. Laid a wreath at Anitkabir Mausoleum, Also met with Ecumenical Patriarch Bartholomew I of Constantinople of the Orthodox Church, attended the Alliance of Civilizations forum, and participated in a town hall meeting with students at the Tophane Cultural Center. Barack Obama. November 14–17, 2015 Antalya	Attended the G-20 Summit Meeting. also met with President Recep Tayyip Erdoğan, King Salman of Saudi Arabia and Russian President Vladimir Putin. Who knew that Saudi Arabia and Turkey were such good friends? Instead, bin Salman spoke of a close cooperation between Saudi Arabia and the Turkish government, and said those trying to damage the relationship between their two countries—whoever that might be—would fail. “Undoubtedly, the cooperation between the Saudi and Turkish governments is unique, and many are trying to use this painful thing to drive a wedge between Saudi Arabia and Turkey,” he said. Bin Salman’s insistence on his country’s good relations with Turkey may seem odd, given that the two countries have clashed many times in recent years. Saudi Arabia is Turkey’s main rival for stewardship of the Muslim world, and an obstacle to better relations with the US. Saudi Arabia and Turkey are also on opposite sides of the Saudi-led blockade of Qatar, and have butted heads over Iran and support for the Muslim Brotherhood. Things between the two countries got so bad that, in March 2018, bin Salman referred to Turkey as part of a “triangle of evil,” alongside Iran and Islamic extremists. Undoubtedly, the cooperation between the Saudi and Turkish governments is unique, and many are trying to use this painful thing to drive a wedge between Saudi Arabia and Turkey. I want to send them a message. They will not be able to do that, as long as there is a King Salman, and a crown prince called MbS, and a president in Turkey called Erdoğan. This wedge will not happen and we’ll prove to the world that … justice will be seen in the end. The Saudi administration has taken an important step by admitting to the murder. From now on, we expect them to uncover all those responsible for this matter from top to bottom and make them face the necessary punishments. … Personally, I do not doubt the sincerity of King Salman. It is very important for such a critical investigation to be carried out by objective, fair teams with no relations to the murder. Secretary Pompeo traveled to Ankara, Turkey on October 17, 2018. In Ankara, the Secretary met with Turkish Foreign Minister Cavusoglu to welcome the decision to release Pastor Andrew Brunson and to discuss other issues of bilateral importance. The Secretary also discussed the Jamal Khashoggi case and reiterate the U.S. offer to assist Turkey in its investigation. How do you think Trump feels about Erdoğan? They have all been allies in the battle to destabilize Syria and oust Assad. Most of Isis volunteers, mercenaries and supplies have traveled across Turkey right through Turkey's border stations. But then again, the US is harboring Erdogan's enemy Fethullah Gullen.